February is almost over. Where did it go? Oh right, I remember – poker. And lots of it. I’ve played every single day this month. 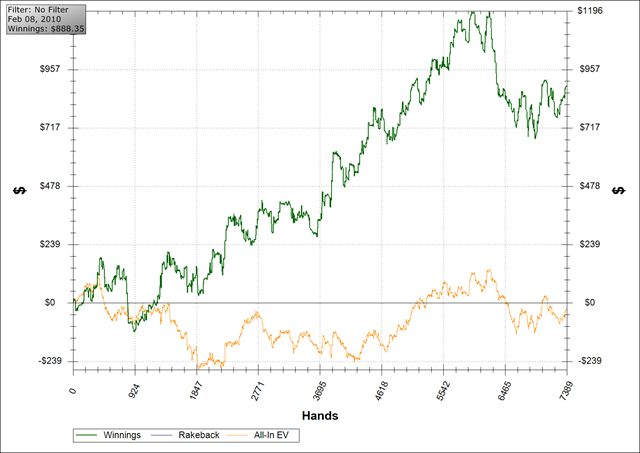 That’s 140 hours and 150k hands (with 18 hours and 20k hands to go in the next 3 days). Wow. Lately I’ve been earning 10k VPPs every 3 days. I’ve started to prefer to play in the mornings, so I’ve altered my sleep schedule to be up a little earlier (like 8-9am). That way by noon I’ve got half my play in for the day. In any case, I finished today and crossed the 90k VPP line and purchased my last “Stellar” reward. Stellar rewards are basically free money during the first 90k VPPs ($1000 in total) spaced out in $10, $50, and $100 increments. Next goal is what took all of last year: Supernova. I’ll be there by 9pm on Feb 28th. My plan is to then crank for a few more days until March 4th when Craig, Art, and Chris come to town to live it up Vegas style. I hope to get like 2 hours a day of play in but somehow that will likely not be realistic…unless I don’t sleep at all for four days straight. Once they leave, I’ll need to earn 3k VPPs per day EVERY day for the rest of the year. Obviously I’ll be earning more than that on some days so I get weekends and holidays, but that’s what it will take to reach Supernova Elite. Sounds crazy. I may well be by the finish line. In other good news, I’ve been breakeven for my last 50k hands, which is a definite improvement over the learning curve landslide that happened in the end of January and first half of February. Since SNE is worth well over $100k, being breakeven in play is just fine (although I’d obviously like to be winning in play too). But for Year 1 of SNE, breakeven would be perfectly ok with me. Apologies for the drought in blog entries. It’s been an exciting last 7 weeks. It all started when I had asked someone online a few questions about their desk. (It’s a Biomorph desk and costs about $2500.) I’m still considering buying one since I sit here about 6-8 hours a day. The current non-ergo one isn’t going to last much longer. In any case, a lot of people on the online forums are just jerks if you haven’t been around as long as they have. However, this guy answered my detailed list of questions and then some. I sent him a thank you and said if he ever needed scripting/coding help to let me know. About a month later, I get an email from this guy saying he’d like some scripting help. So I help him out, and we start chatting a lot. It turns out he’s trying to earn 4M VPPs this year, which is pretty sick as it would be the all time record. However, that’s like 12 hours a day with ~30 days off in the entire year. Insanity. Anyway, it turns out he’s a great player and coach. I finished up with my old coach and was looking for the next level up. There was a lot of scripting work I could do to help him speed up his playing, making sure he was always on 24 tables, etc. In return he would teach me to shortstack. 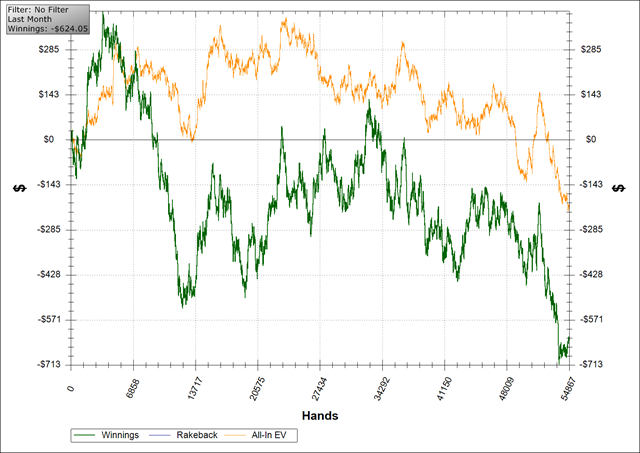 Shortstacking is when you buy in for the minimum amount at the table (usually 20 big blinds). While many people think this eliminates all postflop play, it doesn’t (just ask my ski slope red line). So we wrote up a contract and signed it. At the end of December when I had surgery and was trying to get Supernova, I was also spending a significant amount of time writing scripts for my new coach (Kevin). There were a few days where I put in 15-16 hour days. He was going to the Bahamas on Jan 3rd and I wanted to make sure he was completely up and running by then. I pretty much finished. I continue to do small updates and optimizations, but things are running smooth. In less than a month, I had already spent 100+ hours writing scripts for him. It’s making a huge difference though. Instead of playing 13 hours a day, it’s more like 10 hours a day now. And that matters, since he’s also on chemo right now. Did I mention the insane part? As you can see, starting out, things went pretty well, and then I found the Olympic ski jump. Then I basically broke even for a long time and found another ski jump. I hate ending the month like that. I did manage to earn 19k VPPs in January (which isn’t bad considering I earned most of them in the last week). And that pretty much sucked. Part of the way into February I actually had a 4k VPP day, which is incredible as last year that would have taken at least 2 days, and now it only took about 8 hours. So SNE is becoming reachable. The downside is that I am BEHIND for the year because I didn’t really start going full speed until February. So my goal is to be Supernova by the end of February (yes, this took my all of last year lol). 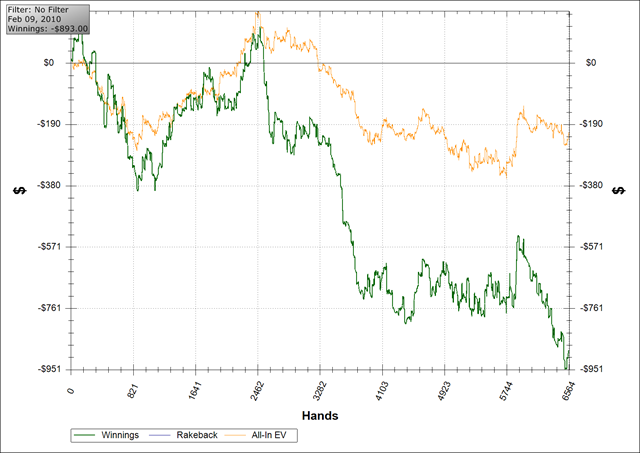 At the end of February I’ll be behind by roughly 61.6k VPPs. Then it’s time to crank out the VPPs in March. I will likely be shooting to earn 100k VPPs from March-November and not work at all in December. My goal is to get my work schedule to a 5 day week where I put in a good 6 hours with 18 tables. This should be enough to get my to SNE once I’m caught up.